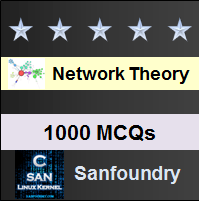 This set of Network Theory Multiple Choice Questions & Answers (MCQs) focuses on “Millman’s Theorem”. 1. According to Millman’s Theorem, if there are n voltage sources with n internal resistances respectively, are in parallel, then these sources are replaced by? Explanation: Millman’s Theorem states that if there are voltage sources V1, V2,…… Vn with internal resistances R1, R2,…..Rn, respectively, are in parallel, then these sources are replaced by single voltage source V’ in series with R’. 2. In the question above, the value of equivalent voltage source is? Explanation: The value of equivalent voltage source is V‘= ((V1G1+V2G2+⋯.+VnGn))/(G1+G2+⋯Gn). 3. In the question above the value of equivalent resistance is? Explanation: Let the equivalent resistance is R’. The value of equivalent resistance is R’=1/((G1+G2+⋯Gn) ). 4. According to Millman’s Theorem, if there are n current sources with n internal conductances respectively, are in series, then these sources are replaced by? Explanation: Millman’s Theorem states that if there are current sources I1,I2,…… In with internal conductances G1,G2,…..Gn, respectively, are in series, then these sources are replaced by single current source I’ in parallel with G’. 5. In the question above, the value of equivalent current source is? Explanation: The value of equivalent current source is I‘=((I1R1+I2R2+⋯.+InRn))/(R1+R2+⋯Rn). 6. In the question above, the value of equivalent conductance is? Explanation: Let the equivalent conductance is G’. The value of equivalent conductance is G’=1/((R1+R2+⋯Rn) ). 7. Calculate the current through 3Ω resistor in the circuit shown below. Explanation: Applying Nodal analysis the voltage V is given by (10-V)/2+(20-V)/5=V/3. V=8.7V. Now the current through 3Ω resistor in the circuit is I = V/3 = 8.7/3 = 2.9A ≅ 3A. 8. Find the current through 3Ω resistor in the circuit shown above using Millman’s Theorem. Explanation: V‘=((V1G1+V2G2))/(G1+G2)=(10(1/2)+20(1/5))/(1/2+1/5)=12.86V. R’=1/((G1+G2) )=1/(1/2+1/5)=1.43Ω. Current through 3Ω resistor=I=12.86/(3+1.43)=2.9A≅3A. 9. Consider the circuit shown below. Find the current through 4Ω resistor. Explanation: Applying Nodal analysis the voltage V is given by (5-V)/1+(10-V)/3=V/4. V=6V. The current through 4Ω resistor I = V/4 = 6/4 = 1.5A. 10. In the circuit shown in the question 9 find the current through 4Ω resistor using Millman’s Theorem. Explanation: V‘=((V1G1+V2G2))/(G1+G2)=(5(1/1)+10(1/3))/(1/1+1/3)=6.25V. R’=1/((G1+G2) )=1/(1/1+1/3)=0.75Ω. I=6.25/(4+0.75)=1.5A.